An Israeli-US organisation has set up a school in the northern Syria governorate of Idlib, which is under the control of armed groups [terrorists], Russia Today reported on Monday. 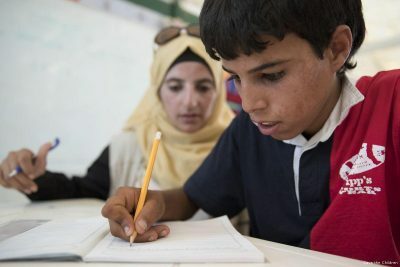 The Israeli syllabus is being taught in the school, with textbooks intended to provide Syrian pupils with a different perspective about Israel. An Israeli news website reported that the school has 90 Syrian pupils and 15 teachers. It is an addition to two similar schools which have been established in areas controlled by the armed groups near the borders of the occupied Golan Heights. Businessman Moti Kahana, a former Israeli air force soldier who holds dual Israeli-US citizenships, is the head of the organisation behind the schools. He hopes that the syllabus will entrench a different perspective about Israel and that pupils will go on to study in Israeli universities.